An original title to start things off! In this first entry I will simply lay out my reasons for starting a blog and what I plan to do with it. A few weeks ago I was forced to rethink my hobbies, or in particular one hobby that took much of my time: computergaming. Since my work as an IT consultant (or software engineer to be more precise) sitting behind a screen all day it became clear to me that with increased stress and having passed the thirty mark did not combine too well with spending another 3 or 4 hours behind a screen making decisions. So when I started my first steps of recovering from a burnout and was told to relax, I of course started with doing what I had liked for years: gaming. I didn’t enjoy it.. I didn’t enjoy very much anyway the first weeks. In fact around that time I opened up a modelkit which I still had laying around and at the first step in the instruction I already folded. Too difficult! However as the weeks went by and I started to become a bit more active I really noticed the difference in required energy between activities. Computergames kept feeling difficult and seemed to ask the most of my thinking abilities and most of the little concentration I was able to give it. 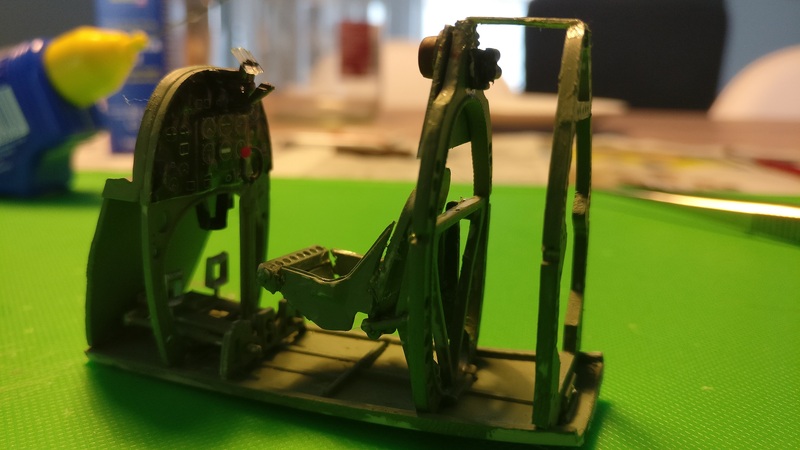 At some point I reopened the modelkit again.. and decided I wanted to try this again, but on a larger scale and with World War 2 era planes. So after buying my first kit (more on that kit in another blog) I went for it, and I completely fell in love with it! It appealed to my engineering side, but without the stress of my day job. I loved working in a structured way, seeing subcomponents become bigger and combining them with the other parts. I loved making decisions about which type I wanted to make, what livery, what rudder, which wingtips. I loved doing the research about what actually would be historically acurate. And I felt challenged by the immense possibilities when it comes to techniques. As a kid my dad introduced me and my brother to modeling. The models I made back then were made with the lack of patience and eye for detail of a child. Sloppy paintjobs, glue everywhere. I just wanted to have them finished so I could play with them! I remember a 1/144 scale silver Starfighter for instance: my dad had airbrushed it for me and told me to wait until it was dry.. when the paint did finally dry up it had the fingerprint of a small kid on it! I don’t know how old I was when I stopped but I know I barely reached a much higher level. But I guess now I am ready again for the fantastic results that can be achieved in scale modeling! It will take some time to get there, but having grown into my big boy pants I do actually have an eye for detail (it is actually a big part of my professional life) and the patience.. well I find I still have to slow myself down sometimes, but at least I enjoy the experience of creating rather than the end result. I am also a perfectionist which will make those first few models a real pain. Having an eye for detail while not achieving the desired detail is a real buzz kill, but more on that in a blog about my first kit. Best of all there now is an incredible amount of information out there and so many great people more than willing to share their knowledge! So: what I would like to do with this blog. My idea is to just make regular posts with everything from new purchases, to changes to my workplace, to techniques I am trying out. After all I am a noob and all these things are still relevant to me! If there ever comes a time I have so much routine they become irrelevant to mention it might become time to change the name of the blog or even start a YouTube channel. I, too, started up with this hobby again as a form of relaxation. Being focused yet relaxed while building and painting a model is very therapeutic. My blog hasn’t seen much new content lately, but that is purely due to my dislike of typing. So, I started a YouTube channel myself because I can get my point across with visuals which I really enjoy. I am looking forward to watching your updates and seeing your work. So right about the relaxation. The past few weeks have really been a lesson in hobbies that give you energy and those that actually cost you, however fun they are. Being creative seems to give much back! I have considered a YouTube channel but for me it is actually the other way around and I feel much more comfortable with typing. What is your YouTube channel Charley? I really enjoy doing a channel since it allows me to show what I am doing. My primary focus is on beginning modelers, but I do other stuff as well: reviews; demos… different things. If you would, leave a comment on one if you check it out so I will know you found it ok.
Just one cannon per side. I did have to do a bit of sanding and trimming on some parts to get the wings to go together properly, but it wasn’t too bad. Sometimes the locating pins are just s bit long, so I trim those off as well. Thanks Brett! I will check that out. Gee model building could never become stressful! It will be fun to follow along.